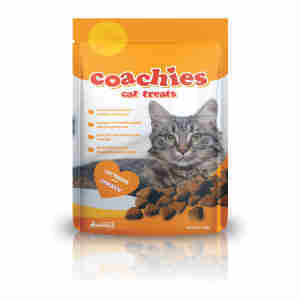 Coachies Cat Treats is a natural cat treat for your cat that is delicious and highly palatable. Oven baked to lock in goodness, they wiil be your cats favourite treat! Protein 27%, Fat Content 20% (Omega 3 12,000 Mg/Kg, Omega 6 36,000 Mg/Kg), Crude Ash 6.4%, Crude Fibre 4%. My cats all loved these treats which is unusual as most treats are liked by a couple of them and not all. They went mad for them and they have a soft texture when holding them with a strong smell of chicken. They really are worth the money but make sure you throw the treats and hide otherwise they will try and take your hand off for them.